Create checklists from scratch or use templates that you build and save. 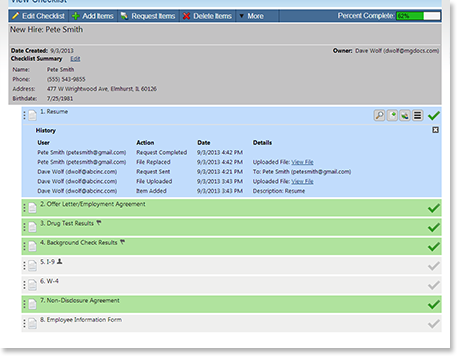 Attach scanned documents to your checklist. Attach spreadsheets or Word files to your checklist. Answer questions or complete required tasks in your checklists. Edit checklists on the fly. 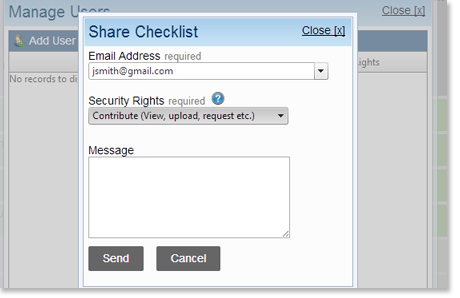 Use the Request feature to automate the collection of documents and data or the completion of required tasks. No signup necessary, just an email address and your customers, partners or vendors can quickly and easily help you get the information you need. 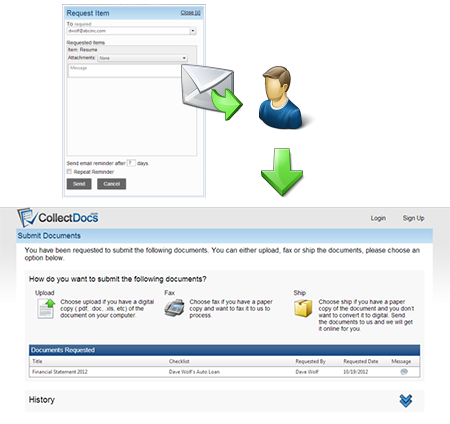 CollectDocs even sends out automatic reminders and notifies users when information has been added or requirements have been met. Add as many users as you want and give them only the access they need - View Only, Contributor, even Admin. Share the responsibility to certain items with other users. When a checklist is complete and all information has been collected, use the export feature to push all of the data into your corporate document management system or line of business application. Quickly see exactly what items are not complete on any checklist. Use the History report to see every detail from the start of each checklist all the way through who exported the completed list.